My selection of home-canned fruit preserves is quite large, almost to the point of embarrassing. Seriously, who needs 15 different varieties of jam and jelly when you know peach, grape, and strawberry are all that you reach for? I needed to get my recipe wheels spinning and come up with some new ways to start using up what I’ve put up! Preheat oven to 400°F. In a medium bowl whisk together both flours, baking powder, baking soda, and salt. In a large bowl combine eggs, milk, vanilla, brown sugar, and oil. Gently fold in the apple pie filling. Carefully add the dry ingredients to the wet ingredients and mix until barely blended; be careful to not over mix the batter or your muffins will become tough. 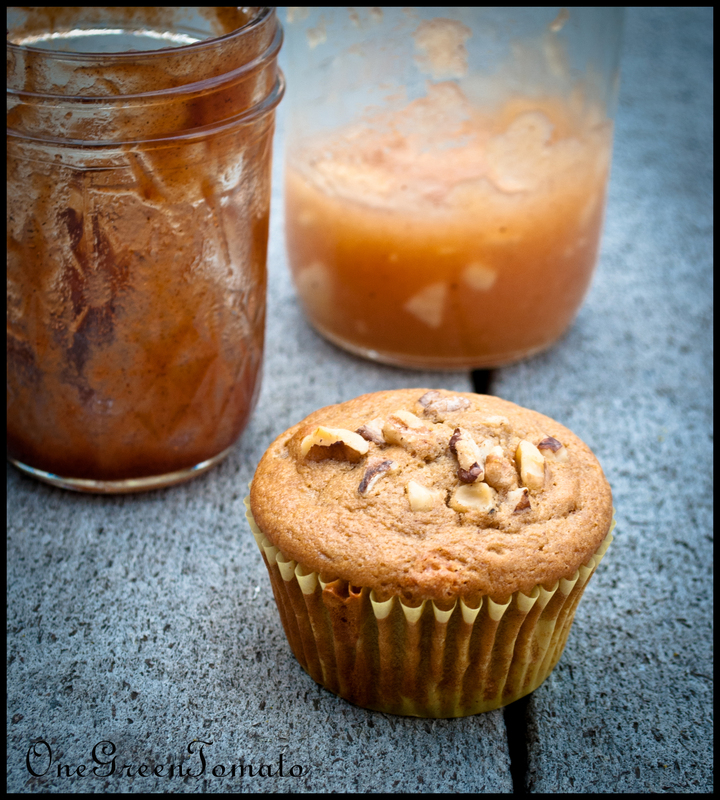 Fill muffin cups halfway with batter then spoon in 1 tsp of the apple butter, top off with more batter. Lightly dust on a bit of granulated sugar and a sprinkling of sliced almonds. Bake for 20 minutes at 400°F or until you can insert a toothpick and it comes out clean. Transfer muffins to a wire rack and allow to cool 5-10 minutes before eating. Images and content copyright © 2016 Danielle R Limoge.